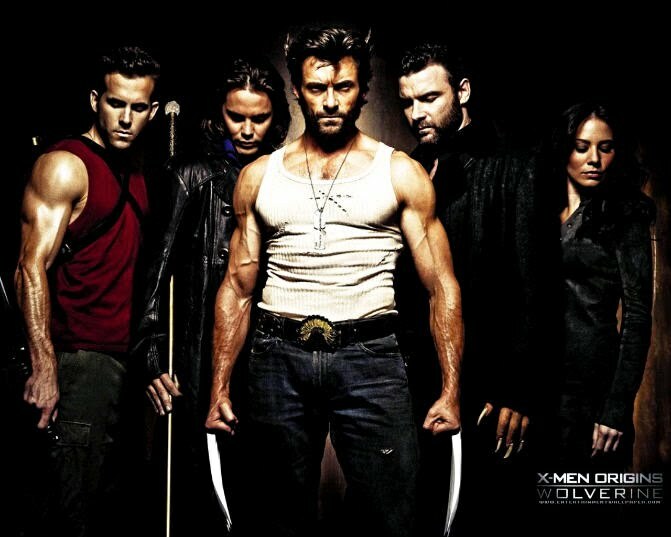 This installment aims to give a little bit of background to the first X Men movie. It stars as usual Hugh Jackman as Logan/Wolverine, Liev Schrieber(Scream, Defiance, looks very much like Balthazar Getty from Brothers and Sisters, for a short while in Series 3 of Brothers and Ssisters Balthazar Getty took a short break, I was thinking for a second maybe he took a short break to make this movie) as his sadistic brother Victor/Sabretooth. Danny Huston(How to lose friends and alienate people) as the younger William Stryker. Will i Am (the lead singer from the Black Eye Peas, looks very much like Edi Gathegi from Twilight) as John Wraith, the lovely Lynn Collins with her mesmerising blue eyes as Kayla Silverfox, Kevin Durand(Martin Keamy in Lost) as the powerful Fred Dukes. Dominic Monaghan (Charlie Pace in Lost, Merry in Lord of the Rings) as the electronic whizz kid Bolt, Taylor Kitsch as the legendary Remy LeBeau/Gambit. Daniel Henney as the super accurate Agent Zero, and Ryan Reynolds(Blade Trinity) as lightning fast Wade Wilson(all the movies I have seen him in so far he never stops talking, theres a funny scene where this is hinted at). Wolverine and his brother are recruited into an elite military team sent to Africa for an artefact, and in the process we get introduced to the other mutants and their powers. The legendary Stan Lee is the executive producer and as any Marvel production the action is non stop. There is a little scene reminiscent of Superman where Logan is found in a barn by an elderly couple. Ofcourse we also meet some of the Marvel characters one of my favorites and the one of the least talked about Gambit, played by Taylor Kitsch I for one hope he gets his own spinoff, the action scenes where he polarises objects in his encounter with Wolverine is superb. Hopefully there will be a further two installments and I can’t wait for more origins for the other Marvel comic characters.